Salmon fillets are a high quality fish that is typically on the higher end of the price range on a restaurant menu. Smoking salmon on a cedar plank at home is one way to enjoy this delicious gourmet dish for a fraction of the cost. With this salmon recipe, you will feel like a professional chef once you taste the end result. Smoking the salmon on a cedar plank solves the age old problem of fish falling apart and through the grates while smoking or grilling it. This is actually one of the most frustrating things that won't happen when you lay your fillets out on the cedar plank. And, you can reuse the cedar plank about 3-4 times before you have to buy new ones. Soak your cedar planks and wood chips in water for an hour. This will help preserve your cedar plank because the water saturation will make it less likely to brown or burn by the heat of the smoker. This will also impart some moisture to provide a sweet and smoky flavor in the smoker to help keep your smoked salmon moist and flavorful. Next, combine your garlic and herb seasoning with the lemon juice and rub into both sides of each salmon fillet. You can even do this a few hours ahead of time to help all of the seasoning marinate into the salmon and provide some extra flavor. Light your charcoal smoker approximately 30 minutes before you want to put your cedar plank salmon on. 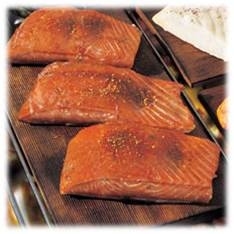 Next simply put your salmon fillets on the cedar planks and put them on the smoker. Place a slice or two of the lemon on top of each salmon fillet. Check the smoked salmon after about an hour and a half to make sure you have the ideal temperature and smoke. You may need to add more wood chips to finish off the salmon. Your salmon should take about 2 to 2 1/2 hours depending on the temperature of your smoker. See below for more information about smoked salmon cooking times and how to determine when salmon is done. If you have some smoked salmon left over when you are done eating, try making some smoked salmon dip for a great appetizer on your meal tomorrow. The cooking time for cedar plank smoked salmon will be about 2 to 2 1/2 hours. There is one simple test you can always perform with fish to check to see if it is done. You can insert a fork or a meat thermometer into the center of the fish for 5-10 seconds. Then pull it out and touch the metal. If the metal feels hot to the touch, your smoked salmon is done. You can also tell because your salmon will shrink down slightly and develop a white liquid on the outside of the salmon.